Everyone has their favorite, but this is the BEST chicken wings recipe! 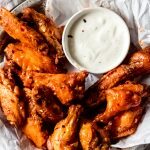 You know I love chicken wings – just take a look at our chicken wing recipes, and you’ll see a ton of different wing flavors – but this recipe is my all-time favorite. Declaring this the best chicken wings recipe is a bold statement – I know, I know – but to me the classics are the best. 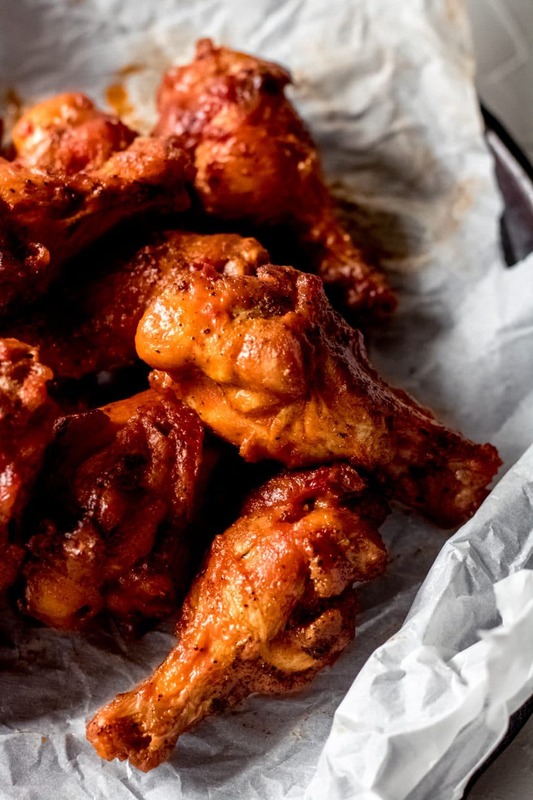 Sure, the other wing flavors are fun – but nothing beats a classic buffalo wing flavor with a medium heat – which is why this recipe is getting the title of best chicken wings recipe at Wanderlust and Wellness! Sure, there are tons of wing flavors out there – but we believe you can’t beat a classic chicken wing flavor. 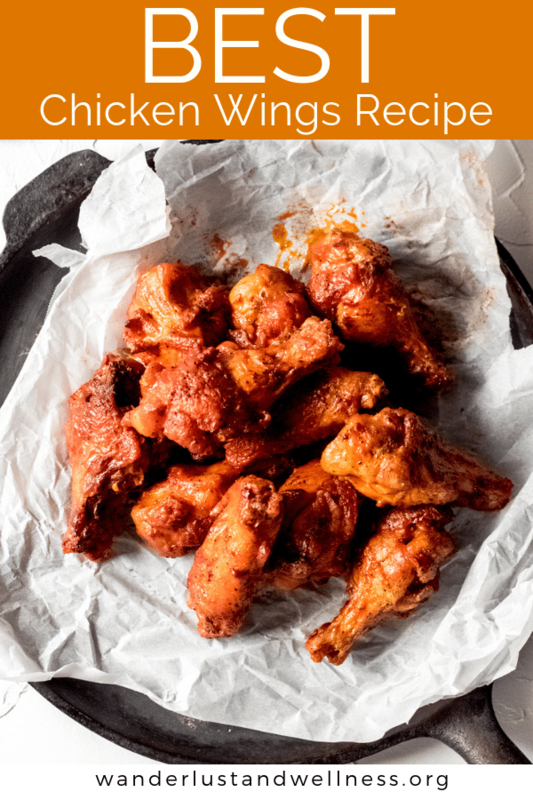 This flavor is close to a classic buffalo but with a secret ingredient that ups that flavor profile to what we consider the best chicken wing flavor! What chicken wings should I buy? I highly recommend buying fresh chicken wings. However, if you’re unable to find fresh chicken wings you can always buy a high-quality frozen option – just be sure to fully thaw the wings before frying. Are chicken wings low carb? The chicken wings themselves are low carb, it’s the sauce you’ll want to review if you’re looking for a low carb option. You can review the nutritional information at the bottom of the recipe for specific carb information. Are chicken wings bad for you? Like I’ve said before, we firmly believe in intuitive eating here at Wanderlust and Wellness and prefer to not categorize foods as good or bad. With that being said, I would recommend reviewing the nutritional information and deciding for yourself. Do these chicken wings have to be pan-fried? 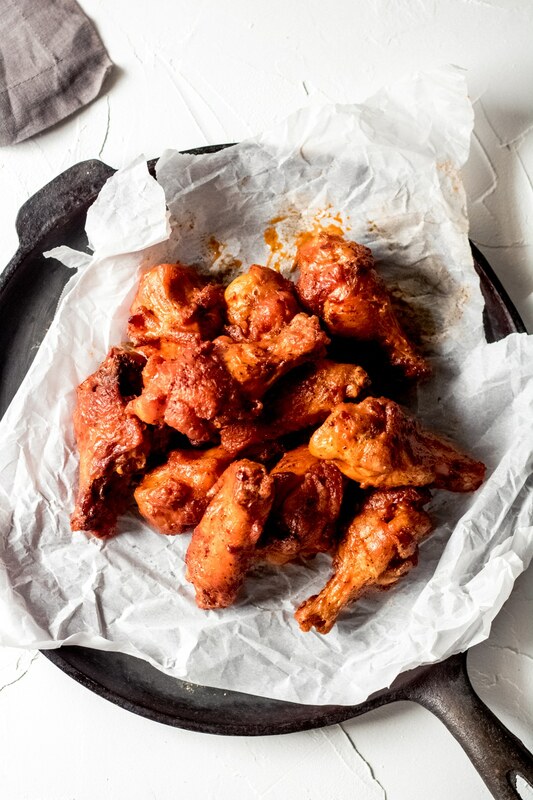 No, while the recipe does call for pan frying the wings, you can also cook them in an air fryer, bake, or broil them as well. In a deep frying pan, heat 2 cups of cooking oil over medium-high heat. I recommend using avocado oil. 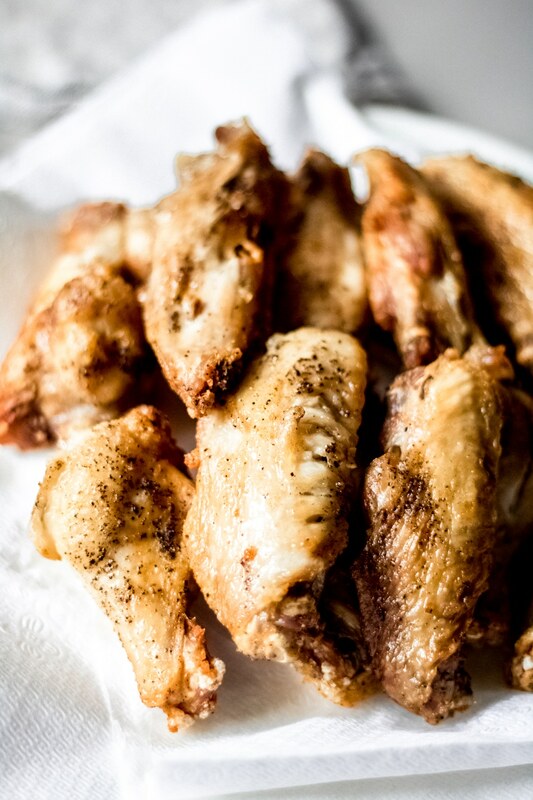 Next, season the wings with salt and pepper – (be sure to first pat them dry from any remaining water). Place the seasoned wings into the oil. Fry the wings for about 10 minutes on one side, then turn and fry for another 10 minutes. 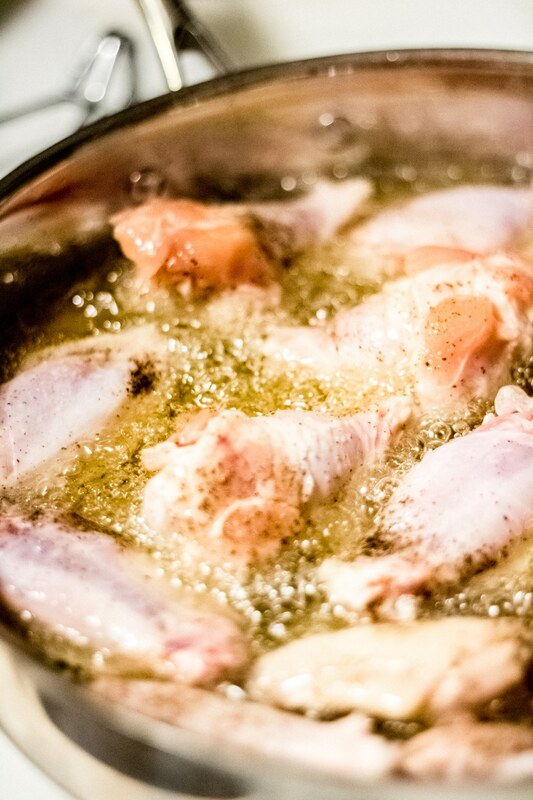 After the wings have finished cooking, remove from the oil and place onto a paper towel-lined plate to rest. Finally, dip the wings individually into the sauce and then place onto a serving platter and serve immediately. Enjoy these other chicken wing recipes! This is hands-down our favorite chicken wings recipe – which is why we’re giving it the title best chicken wings recipe! If you liked this recipe, please give it a 5-star rating. In a medium-sized saucepan, add the hot sauce, butter, ranch dressing, and red pepper flakes. Heat over medium heat, stirring occasionally until the butter is melted. Reduce heat to low. In a deep frying pan, add the 2 cups of oil and heat over medium-high heat until it reaches 350 degrees F.
Season the chicken wings with salt and pepper, then add them to the hot oil. Cook for 10 minutes on one side, occasionally moving the wings to keep them from sticking to the bottom. Then flip and cook for another 10 minutes. Once finished cooking, remove from oil and transfer to a paper towel-lined plate to rest. Turn the oven onto the broil setting and prepare a baking sheet. Line a baking sheet with foil then set a cooling rack on top of the lined baking sheet. Or, you can use a broiler pan. Using tongs, dip the wings individually into the sauce and place onto the cooling rack. Place the pan into the oven and let the wings sit under the broiler for about 2-3 minutes. Watch closely so they do not burn. Remove from the oven, then once again dip each wing individually into the sauce one again, then transfer to a serving platter and serve immediately. Be sure to use fresh or thawed chicken wings – never frozen. Adjust the red pepper flakes quantity to increase or decrease heat. If you need a dairy-free ranch, check out my Paleo Ranch dressing.